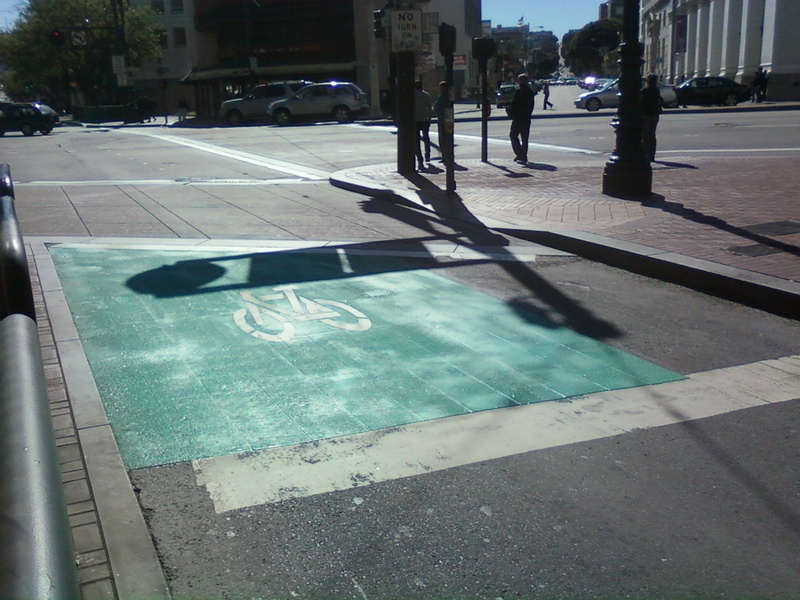 The green bicycle boxes and bike lanes along Market Street have been touted as a great first step to a Better Market Street. I've used them myself once (since I generally crosstown commute from Ocean Ave to The Bayview) and found them to provide a level of assurance and safety I'd never felt riding in San Francisco before, but as I came out of Van Ness Station and waited to cross to Bank of America I noticed something peculiar. In many different locations approaching the intersection, and especially at dusk, these green safety boxes appear to disappear from sight. Just thought I'd throw that along. The real reason I came to Van Ness and Market was to see for myself how these traffic control devices were implemented, why they should be there in the first place, and how the public was responding to these new devices. It seems a station agent at Forest Hill has provided their work number to Wells Fargo Bill Collections. Mayor Ed Lee has proposed the transfer of street-side tree maintenance of some 24,000 trees over to homeowners during the next seven years, saving the City a whopping $600,000. The plan would transfer 6,400 trees next year, and complete the transfer of the remaining 18,000 trees within seven. Any property owner who wants to object to a transfer would be able to via an established public hearing process. This year, the SFDPW spent $2.2 million on street-tree care, Mayor Lee's proposed budget would cut that amount to $1.6 million. The proposal must first be approved by the Board of Supervisors.